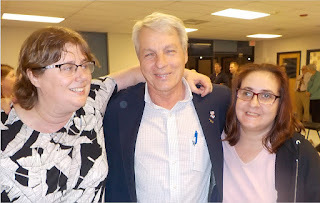 Kelly Dorsey, Sen. Suzio, and Michelle Bell. North Haven - Sen. Len Suzio (center) on May 2 attended a Meet Your Legislators event at The Arc of Greater New Haven. The event, which allowed area residents to interact with state lawmakers in a casual setting, was sponsored by The Arc Connecticut, SARAH Inc. and The Arc of Greater New Haven. Suzio represents Cheshire, Meriden, Middlefield, Middletown and Rockfall. He can be reached at Len.Suzio@cga.ct.gov or call 800-842-1421. On the web: www.SenatorSuzio.com and www.arcgnh.org .